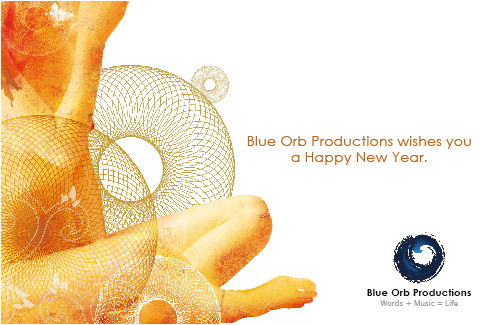 Blue Orb Productions wishes you a Happy New Year. A lot has happened in this last year. For many, there was much pain and misfortune that affected us, and I personally went through some personal trials and hardships this year that have transformed my life, but there are signs for hope in this new year. A song that I hope will remind us all of the will and personal responsibility we will all share to make this a truly new year. Things should never come undone again. Love and Peace to you all in this year of the Bull. Let us rage on into the brave new future. I wrote this song during my stay with the wonderful band echostream, and it was originally recorded as a demo for echostream but never got released. I've sat on in it for years now always trying to find somebody to sing it. In the end, I finally broke down and let my own voice tell the story. Let the lyrics hit you as they may. All I will say is, things in life do come undone. So much around us has come undone, and everyone is ready to start pointing fingers and blaming. But who was it that allowed things to get so far? Think hard, and think deep.... the truth is, you are in control of your own destiny, and you alone control the fibers that keep the universal love and happiness that we need to keep it all together. Let us never let things come undone again. Back on the run, God what have I done? How'd it all come so undone? Can't someone, reach out to me? Can't anyone, look inside me? Can't you see, something's dying? Happy New Year from Deron and Yoko at Blue Orb Productions! New music from The Geminiac on Oasis Radio!